Get into your dream law school. 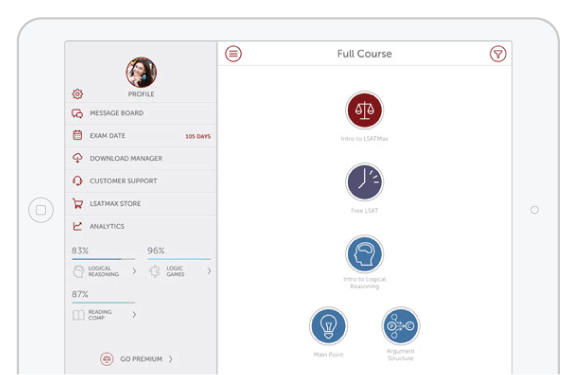 LSATMax is the pioneer in comprehensive LSAT prep on mobile, and the only course to offer students lifetime access at an unbeatable price. LSATMax has a LSAT prep plan for you no matter where you are with your prep. Select between lifetime and subscription options and even finance one of our lifetime courses. I went from a 152 to a 174. Now I have an actual shot at Harvard…pretty cool. What are the Benefits of Our LSAT Prep Course? Watch our expert instructors work through LSAT concepts and questions with proven strategies that will never let you down. Get your questions answered by our expert instructors via the app’s real-time message boards. Our app’s analytics track your progress and pinpoint where you should spend your precious time. Instant access that lasts a lifetime so you never have to worry about losing access to your LSAT prep materials. 0% financing available with Affirm for our lifetime courses with payments as low as $38/month. 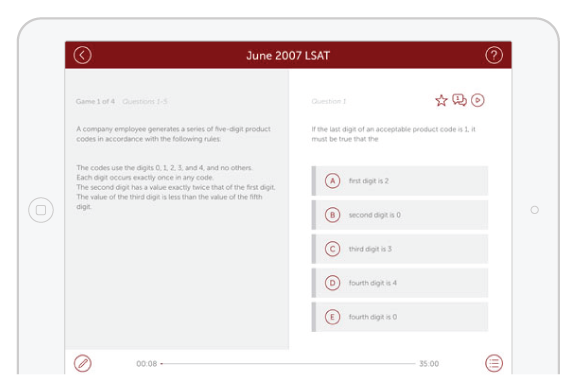 Prep Tests 1-86 and the June 2007 LSAT are available in the app as well as in hard copy format. 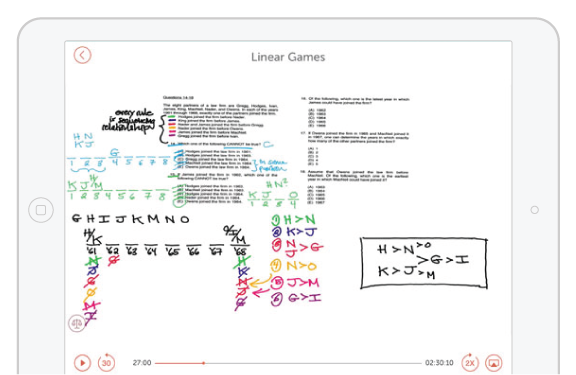 80+ hours of whiteboard video lessons cover every concept and question type on the LSAT. LSATMax has helped thousands of students around the world raise their score and get into the school of their dreams. I scored below a 150 on my first practice LSAT in November. In June I took the LSAT and scored a 170. I couldn’t have done it without LSATMax. LSATMax is my hero! My starting score was around a 155-158, and I scored a 170 on the June LSAT! The instructor taught me the unseen, underlining way to look at LSAT questions in a much more tangible way I could understand. A patented, LSAC approved test day timer. The highest-rated LSAT prep app in the App Store. 4.7 out of 5 based on 477 user ratings. 2018 Best LSAT Review Course. Crush The LSAT has named LSATMax the best LSAT review course of 2018! Common Questions About the LSAT. Can you retake the LSAT and improve your score? Where to start with the LSAT? How long do LSAT scores last? Where are LSAT test centers? Which LSAT section to study first? What do I need for the LSAT? How is the LSAT scored and how does scoring work? This really depends on both how and how long you prepared for your first attempt. If you signed up for an 8-10 week course right before your LSAT, then you can absolutely improve your score by continuing to prep and retaking the LSAT. Generally speaking, the longer you prepare for the LSAT, the higher you will score. This of course assumes that you are preparing with the correct strategies but the LSAT is learnable. What makes the LSAT unique in terms of standardized exams is that it is not a subject based exam. You are not being asked to memorize and regurgitate on the LSAT. You are being asked to change the way you think and changing the way you think takes longer. The best place to start is by taking a real practice LSAT under simulated exam conditions. 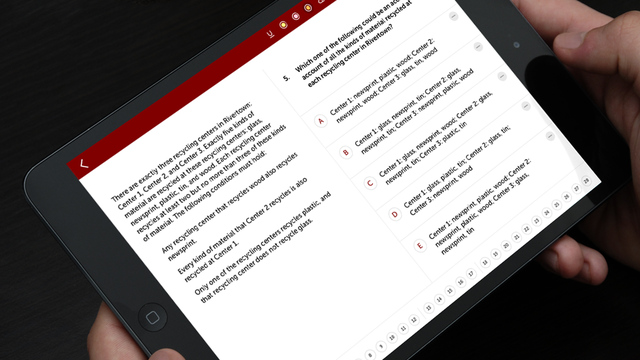 You can even simulate exam conditions with our iOS app, Exam Proctor. Taking a practice LSAT will give you a very good understanding of the exam as well as your current score. Just do NOT get discouraged if you score lower than you were expecting. Remember, our founder's first practice LSAT made him reconsider law school altogether. Your LSAT score is valid for five years. The Law School Admissions Council reports all LSAT scores for the prior 5 year period automatically. Your LSAT score must have been valid when the application cycle opened. For example, assume a law school's application cycle opened on September 1, 2018. Students submitting an LSAT score for this application cycle must have taken the LSAT on or after September 1, 2013. LSAT test centers are the physical locations where LSAC officially administers the LSAT. Test centers are available in the United States as well as abroad. 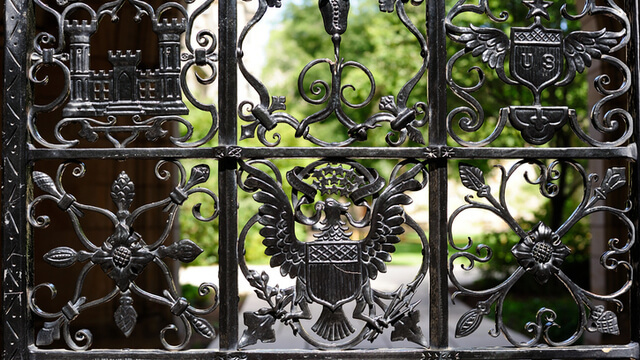 These locations can be law schools, universities, community colleges and even hotels. LSAT centers do fill up so if you are taking the LSAT, make sure you formally register as soon as possible to ensure that your ideal test center is available. You can really study any of the three sections, i.e. Logical Reasoning, Logic Games and Reading Comprehension, first. What matters more is getting started with your LSAT prep as soon as possible to maximize your prep time. That being said, LSATMax does provide a recommended LSAT study schedule to guide your prep because certain concepts build off of previous ones (e.g. Strengthen with Necessary Premise builds off of the concept of Sufficient & Necessary) so it is a good idea to go in order to avoid feeling lost and/or confused. Your LSAT Admission Ticket - you must present and sign page 1 of your admission ticket at the test center check-in table. The printout of your admission ticket must display the photo that you uploaded through your LSAC online account. Valid, Government-Issued Photo Identification - you will be required to present a valid, government-issued ID. The ID must be current (or have expired within 90 days of your test date) and must contain a recent and recognizable photo of you. The first and last name listed on your ID must match exactly the first and last name printed on your LSAT Admission Ticket. Pencils - bring three or four sharpened No. 2 or HB wooden pencils with good erasers. Mechanical pencils and mechanical erasers are prohibited. Pencils and sharpeners WILL NOT be supplied at the test center. 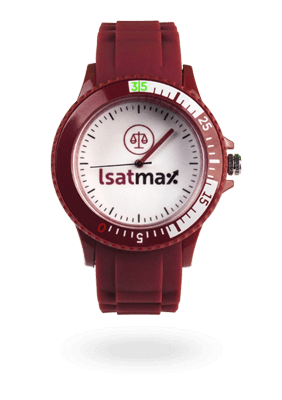 LSAC approved analog LSAT watch - you cannot use any digital timers on the LSAT so get comfortable taking your practice LSATs with an analog timer. Your LSAT score is entirely based on the number of questions answered correctly on the four scored multiple choice sections of the exam. Each LSAT has 100 or 101 questions and the number you answer correctly is your raw score. Your raw score is then converted using your specific LSAT's conversion chart into your scaled score of 120-180. The most significant argument for taking the LSAT over the GRE has nothing to do with the structure of the tests. The fact remains that 75 percent of law schools do not accept the GRE. Why limit yourself to a handful of schools if you have a serious desire to be a lawyer? If you’re aiming for the best law schools in the country, for instance, you’ll be able to apply to Harvard but not Yale. The Law School Admission Test (LSAT) will be one of the most intense situations you’ll ever encounter, one filled with an incredible amount of pressure. Why not arm yourself for the experience by preparing yourself in the best way possible? LSATMax will do just that. The LSAT measures the skills that will be critical to your success in law school. It tests, for example, your ability to comprehend complex text passages with insight, and your ability to organize and manage information. You’ll also need to show that you can think critically, and that you can evaluate and analyze how others argue and reason. And that only scratches the surface of what you’ll be asked to do. 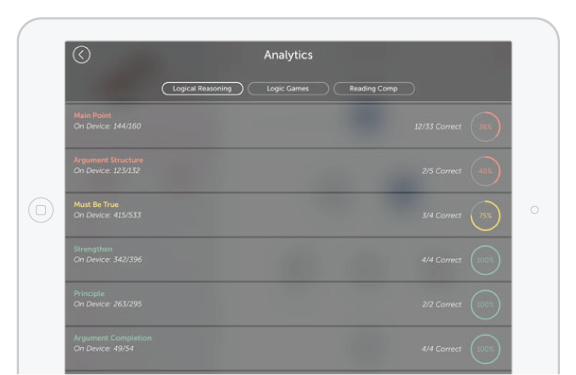 When you use LSATMax, you’ll be able to identify any weaknesses in your LSAT preparation strategy. Then, when the time comes to take your actual test, you’ll enter the examination room with total confidence. 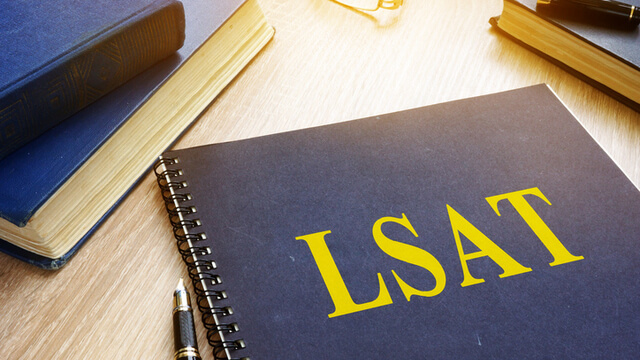 If you’ve already taken the test and need to improve your LSAT score, we’ll give you the tools you need to finally gain the law school admission you covet. LSATMax is affordable enough to fit nearly any budget, and is available for use on your desktop or mobile device. You can get it for less than $40 per month and 0% financing. But affordability is one thing, and effectiveness is another. As thousands of law school graduates can attest, LSATMax works. These are just a few of the features included in this powerful tool. You will receive five drills each day that will help instill key LSAT test concepts in your mind. We will test your ability to identify all of the different types of questions you will encounter, such as those that are found in the Logical Reasoning portion. These include Necessary Premise, Main Point, Cannot Be True, Must Be True and many others. These drills will help ensure that you know these and other critically important concepts like the back of your hand. Most people see Logic Games as the biggest hurdle to achieving a high LSAT score, but with enough practice you’ll be more than ready to overcome this obstacle. This section will test your logical reasoning capabilities, such as being able to draw conclusions from statements. The challenging aspect of Logic Games is that there will be no one correct answer to the questions. You’ll need to be able to thoroughly analyze the entire range of possibilities – and do so very quickly. LSATMax will help you prepare for some of the curves that this area of the test will throw your way. You can’t take any single component of your LSAT preparation for granted. You might think that the reading comprehension area of the test won’t require your full attention, but you’d be wrong. Each reading comprehension section will typically consist of up to eight questions involving a 400-500-word passage from a work related to the law, social sciences, arts and humanities or social sciences. In order to pass, you’ll need to show laser-like focus on each and every passage, no matter how boring you may find it to be. The last thing you’ll want to do is panic during the middle because you’ve lost your train of thought. LSATMax will make sure you are completely comfortable with this area of the test, and help you avoid the catastrophic mistakes that can sink your score. In order to fully appreciate what you’ll encounter when you take your LSAT, you should take a practice test. We offer the actual June 2007 LSAT, using the same questions that were asked. This will give you a complete picture of the complexities of the exam. In addition, we provide you video explanations of the Logical Reasoning and Logic Games portions from that 2007 test. You’ll see world-class instructors giving you step-by-step explanations of these sections, and then showing you the strategies needed to earn the best LSAT score possible. If you make mistakes, you’ll learn why you made them so you can avoid replicating them when taking the real thing. 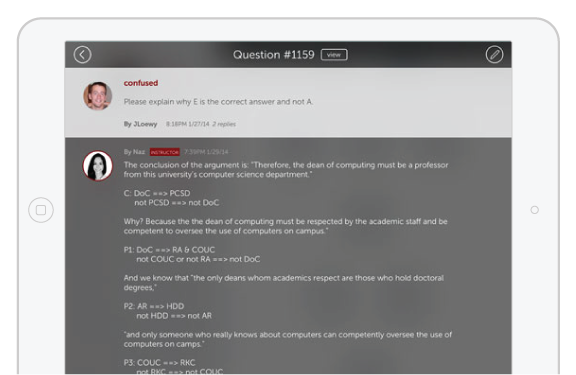 This feature lets you simulate the actual experience of taking the LSAT – it’s the closest thing you’ll get to the examination room. Not only does this app tell you when to start and finish each section, it also offers background noise to add even more realism. Far too many prospective law school students fail to properly prepare for the LSAT. LSATMax will provide the foundation you need in order to help you determine the best strategy and approach that will deliver success. It will also help you face your fears head on so that you’ll be ready for everything. LSATMax will also break you of some of the bad habits that could ruin your test, and put you in the best possible position to get into the school of your dreams. You’ll work incredibly hard, but that effort will be worth it in the end.